We know that James McLean arriving on the Sarah Botsford IS the Bathurst Saddler! Family history research can be so rewarding – not to mention addictive. Also, progress is so much faster when we collaborate! Thanks everybody and, as usual, you all know who you are! 🙂 The James McLean described in the previous post who was a Saddler in Bathurst is INDEED the same James who arrived on the Sarah Botsford in 1842 with Edward and Mary Jane McLean (nee Gordon) as a baby. I’m deeply grateful to descendants of his who have provided more information. Apparently the family weren’t aware of the newspaper reports (see previous post), but did know that their ancestor James MacLean (or McLean), had arrived on the Sarah Botsford as a toddler. They also knew that the Sarah Botsford had sailed from Glasgow, so had naturally assumed (given their Scottish name) that James was Scottish. The information in those news reports must have been provided by family members, or friends of James though, so he is clearly from the north of Ireland. Also I read through the whole list of people on the Sarah Botsford and can only find one James McLean or any name like it. We still don’t know for sure that James wasn’t born in Glasgow. As Bruce suggested it’s possible that the McLeans could have been there for some time arranging their passage to Australia. Possibly James’ son who provided the death certificate information and was closer to events was right about this. I think it most likely that James was born in Ireland before they left though. Margaret Long had “travelled with him [Edward] from home” entrusted to his care by her family – probably the arrangements to emigrate had already been made. On the down side, unfortunately Geoff, the Eliza McLean who died in Penrith in 1922 isn’t ours either! She was born about 1842 and married to Donald Hugh McLean. I don’t know what else to try apart from sending for more certificates! Does anybody have any suggestions? Our McLean ancestors are starting to seem less shadowy and more interesting though, so I’ll write a chapter of “The story” about them next. Many thanks both Geoff and Bruce for your tips about the McLeans. Surely together we’ll even pin down Eliza Boak or Bolk eventually! Meanwhile I’m doing some more circling around her by finding out all I can about her eldest step-son James McLean. Our James McLean was certainly the son of Edward McLean and Mary Jane Gordon. He arrived from Ireland on the Sarah Botsford with his parents Feb 15th 1842 aged one year. Was he the James McLean of Penrith who married Mary Ann Willcock (or Wilcox) 9 Feb 1867, then moved to Bathurst where he was a Saddler, father of four surviving children and died in 1916? I think so, although a few things make it very difficult to tell for sure. It’s certainly the same James MacLean as in the death certificate. 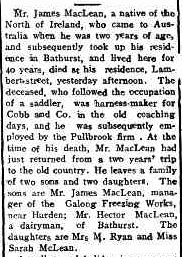 As well as him being a Saddler of Bathurst, the news report comes just the day after the actual death and there are the same sons and daughters. Can we assume that the informant for the news item just had different place of birth information to the son who registered the death? If so, 2 years old on arrival is very close to our James who arrived aged 1, and we know that both the parents of our James were from the north of Ireland. In 1853 when James’ father died the family were in Balmain. In 1869 when next heard of, James’ elder sister Margaret, his step-mother Eliza and half-sister Jane were living at Regentville House, Penrith. It seems likely that James would be near his family before his marriage in Penrith in 1867. Maybe it’s also worth noting that Margaret Sheils, James older sister, moved to Bathurst in 1873 after the apparent loss of her husband. Another James McLean was a suicide at Bondi in 1896. He’d have been the right age, but wrote a highly literate farewell note and was a Tutor! I don’t think our relation, whose mother was illiterate, would have been so erudite. What a relief. I think ours is almost certainly the Saddler, and have put him in my family tree!. What do you think? That demmed elusive Eliza Boak (or Bolk)!! I’ve been writing up more details about the early Forsters of the Coquet River valley in Northumberland (in the chapter on “The Forsters of Rothbury” – see link in right hand column), and think I’ll draw a map to make their movements around the valley in the 18th century a bit clearer. I’m also about to add a few paragraphs about the McLeans, and have just spent a couple of days trying to find out more about the mother of Mary Jane Forster. We do actually know a bit more than we did, thanks to Bruce and the wonderful TROVE. She was living with her eldest step-daughter Margaret (who had married John Shiels in 1856) at Regentville House near Penrith in 1869 when it burned down. There is a lot of detail in the Inquest report, including “Eliza McLean, sworn, states: I am Mrs. Shiel’s mother…” and “John Sheils, sworn, states: I principally reside at Regentville. I go up into the mountains occasionally as I have had a house at Eighteen Mile Hollow at Woodford which I keep as an accommodation house for the public. My Sister-in-law Jane McLean was up when I returned [to Woodford]”. We know a few things about Eliza from this. Firstly she was obviously still alive and fit in 1869. Secondly, when her husband died in 1853 leaving her with four step children as well as her own 3 year old daughter Mary Jane, Margaret the eldest was only 14. Sixteen years later Eliza and Janey are living with Margaret, very much part of the family. 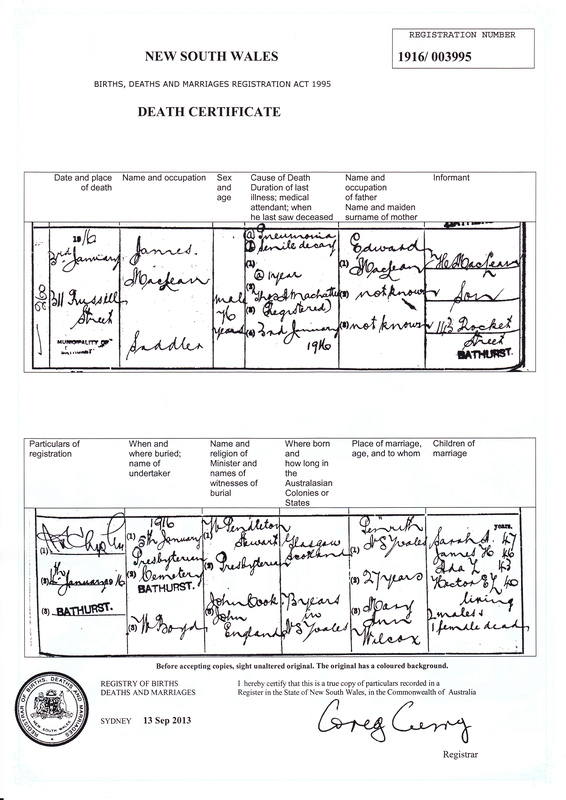 I concentrated on trying to find her death details rather than where she came from as we’re not even sure of her surname from the two documents we have – her marriage certificate where she is “Eliza Bolk” and signed her name X so was presumably illiterate, and the birth certificate of her only child Mary Jane McLean, where she is Eliza Boak. The death certificate should tell us where she came from. Except I still can’t find it!! This isn’t 19th century Ireland where many records have been lost. In late 19th century Australia when anybody died the death was registered! We’re probably not talking about a homeless person where identity might have been a problem but somebody with a family. I can’t find an Eliza (or Elizabeth) McLean who died in the Blue Mountains or Bathurst where her step-daughter Margaret is known to have lived. Her stepson Robert lived in Ashfield. She died at 29, and was born in Middlesex, the daughter of a Joseph Millard McLean, bricklayer, and Louisa Stevens. Trawling through TROVE hasn’t helped either. Should I send away for more certificates? There are a couple of possibilities. Could she possibly have remarried after 1869? You’d think if she was going to she would have already! Could she have gone to Melbourne to be near Mary Jane? If so there’d most likely have been a death notice and I can’t find one. Any suggestions? On another note, does anybody know what happened to James McLean the 2nd son of Edward McLean and Mary Jane Gordon and who came from Ireland with them? Update 14 Jan 2016: The James McLean mystery is now solved at least- see later posts. Update 18 Jan 2016: To save others wasting time and money, and in case it’s useful to other families, here are some details from each fruitlessly purchased death certificate for Eliza McLean. Eliza Jane McLean died in Ashfield in 1900 in a private hospital aged 29. She was born in Middlesex, England to Joseph Millard, Brickmaker, and Louisa Stevens. She was married in Leichardt aged 24 to Donald Allan McLean and had a 4 year old daughter, Louisa. Eliza McLean died at Emu Plains in 1922 aged 80. 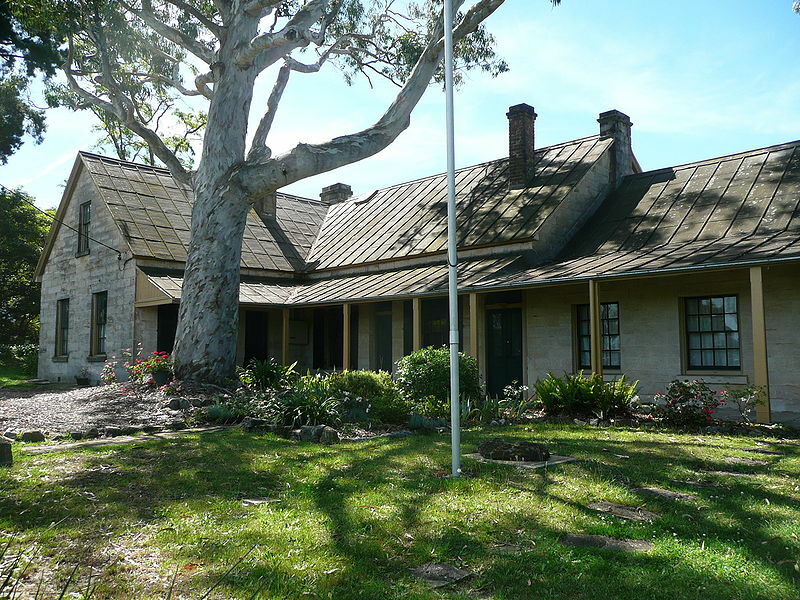 She was born at Williams River NSW to Samuel Gibson, a Farmer, and Mary Ann Russel. She married Donald Hugh McLean in Manning River in about 1900 and had 8 children. Eliza Heath McLean died in Woollahra aged 80. She was born in Hobart, Tasmania to John Heath, Lawyer, and Mary (surname unknown). She was married in Hobart to Robert Anthony McLean and had 9 children still surviving and 4 dead. Eliza Grace McLean of Emu Plains died in Lewisham Hospital (death registered in Petersham) in 1901 aged 4 years. She was born in Liverpool NSW, the daughter of Samuel Mclean, Constable and Colina Burges.